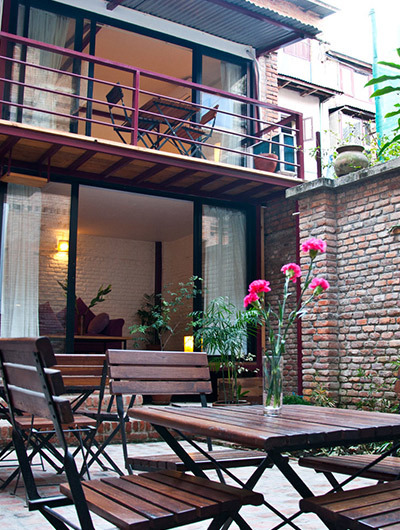 The location of Hotel Northland in Thamel, the tourist hub of the capital, is ideal for all types of guests, whether they be on business or leisure, since it is in the midst of both tourist sites and commercial centers. it has 36 wellequipped single, double, king-sized bed, and deluxe rooms having attached bath with hot and cold shower, air-conditioning, high-speed WiFi internet, multi-channel cable television, long-distance telephone facility, 24-hour room service. The hotel is ideally located in the heart of Kathmandu, and is suitable for both business and leisure travelers. Nestled in a picturesque meadow close to Swoyambhunath Stupa, New Hotel Panda offers a blend of traditional hospitality and elegance. Just west of Thamel, Tibet Peace Guest House provides a quiet garden environment only five minutes walk from the heart of Kathmandu’s tourist scene.